Wool rich and specifically engineered to deliver maximum protection and comfort for feet that hurt in the most extreme cold conditions, these men’s and ladies' Thorlos Extreme Cold Cushioned Ski Socks feature unique padding engineered for wearing with cold weather boots. 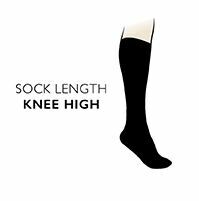 The mix of worsted wool and exclusive Thor-lon fibre in these long leg socks promotes thermal efficiency, breathability (along with an inbuilt ventilation panel), wicking and warmth, while the looped padding has been clinically shown to reduce blisters, pain, pressures and moisture. Low profile toe seams resist rubbing and irritation during use, and additional cushioning at the instep and arch of the foot improves fit and support.